Teeth whitening is one of the newest trends in the beauty industry. Once a practice restricted to dentists and other professionals, it has now filtered down to the masses, with everyday women and men taking the appearance of their pearly whites into their own hands. However, it remains a difficult practice to engineer on your own, which is where brands like Warpaint come in. 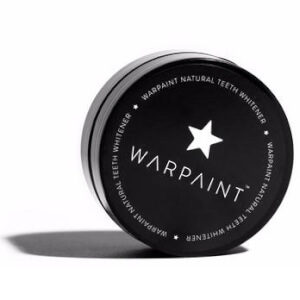 Warpaint is an Australian-based brand boasting just one product within their range, an at-home teeth whitening powder that can be used a few times weekly. Taking a holistic approach rather than promoting harsh, chemical alternatives, Warpaint draws on the power of activated charcoal. A key ingredient in the natural teeth whitening world, this often-messy black powder essentially draws out impurities in the mouth, leaving your teeth looking whiter and your gums healthier. The addition of natural and organic extracts such as sweet orange oil, peppermint and bentonite clay help bolster the effects of the charcoal, as well as providing the powder with a fresh taste. After just a few weeks of using Warpaint in your routine, you’re bound to notice the difference. Not only will your teeth appear whiter, gums will be healthier and infection will occur less often. Warpaint has also been found to strengthen the enamel of the teeth and improve the breath. What are you waiting for? Warpaint can be used every day or a few times a week based on personal preference. Despite being dark black in colour, the formula has been specifically designed to leave behind no residue and cause no discolouration to the teeth (other than helping them sparkle and shine bright, of course!). Simply grab a hold of your favourite toothbrush, wet slightly and dip into the powder before brushing onto the teeth and gums as you would with toothpaste. Voila--the answer to whiter, more beautiful teeth! Shop Warpaint today with lookfantastic Australia, your official stockist. Free Australia-wide delivery on all orders over $50, plus select Afterpay at checkout to shop now and pay later.